The Lily Font is a large silver-gilt baptismal font used at the baptismal services of members of the British Royal Family. 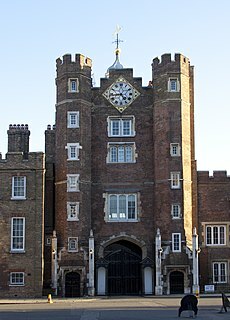 It is part of the Royal Collection and is kept at the Jewel House at the Tower of London when not in use. The Lily Font has been used for the baptism of all the children and grandchildren of Queen Elizabeth II except that of Princess Eugenie of York. The font was commissioned by Queen Victoria from the silversmiths Edward Barnard and Sons in 1840, for the baptism of her first child, Victoria, Princess Royal on 10 February 1841, her parents' first wedding anniversary. The font is made from silver gilt that gives the appearance of gold. Three winged cherubs sit on the base of the font, sitting above the royal arms of Victoria, Prince Albert and the Princess Royal. Albert assisted with the design of the font. The cherubs are plucking lyres, above them leaves reach up to support the bowl that is edged by cascading water lilies. The Lily Font is used with the 1660 font and its basin or the Christening Ewer and Basin during baptismal ceremonies. The Lily Font has been used for the baptism of all the children and grandchildren of Queen Elizabeth II except that of Princess Eugenie of York. Eugenie's baptism in 1990 was the first public baptism for a member of the British royal family. The Lily Font was taken to St. Mary Magdalene Church, Sandringham for the baptism of Princess Charlotte of Cambridge in Norfolk in 2015. It was reported that this was the first time the font had left London in its history, though it had previously been kept in Windsor, from where it had been taken to London in 1926 for the baptism of Princess Elizabeth (later Queen Elizabeth II). ^ "Barnard & Co. - The Lily font". The Lily font. Royal Collection. Retrieved 11 August 2015. ^ a b Hannah Pakula (13 November 1997). An Uncommon Woman. Simon and Schuster. ISBN 978-0-684-84216-5. ^ Keay, Anna (2012). The Crown Jewels: The Official Illustrated History. London: Thames and Hudson. p. 131. ISBN 978-0-50028982-2. ^ Siân Ranscombe (19 July 2015). "Prince George's christening gown: the true story". The Telegraph. Retrieved 10 August 2015. ^ Sarah Bradford (28 February 2002). Elizabeth: A Biography of Her Majesty the Queen. Penguin Books Limited. pp. 59–. ISBN 978-0-14-100655-0. ^ "Princess Charlotte christening: royal baby to be baptised with 175-year-old ornate font which will leave London for first time". The Evening Standard. 5 July 2015. Retrieved 10 August 2015. "The Lily Font". Royal Collection Trust. Inventory no. 31741. The British royal family comprises Queen Elizabeth II and her close relations. There is no strict legal or formal definition of who is or is not a member of the British royal family. Princess Eugenie of York is a member of the British royal family, and the younger daughter of Prince Andrew, Duke of York, and Sarah, Duchess of York. She is ninth in line of succession to the British throne, after her elder sister, Princess Beatrice of York. Victoria Eugenie of Battenberg was Queen of Spain as the wife of King Alfonso XIII. 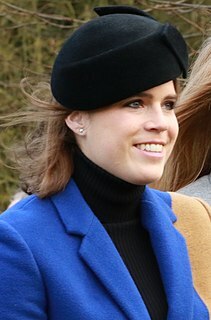 Lady Louise Windsor is the elder child and only daughter of Prince Edward, Earl of Wessex, and Sophie, Countess of Wessex. She is the youngest granddaughter of Queen Elizabeth II and Prince Philip, Duke of Edinburgh. She is twelfth in the line of succession to the British throne. This is a list of those who have held the title Princess of the United Kingdom from the accession of George I in 1714. This article deals with both princesses of the blood royal and women who become princesses upon marriage. Franz Xaver Winterhalter was a German painter and lithographer, known for his portraits of royalty in the mid-19th century. His name has become associated with fashionable court portraiture. Among his best known works are Empress Eugénie Surrounded by her Ladies in Waiting (1855) and the portraits he made of Empress Elisabeth of Austria (1865). White Lodge is a Grade I listed Georgian house situated in Richmond Park, in the London Borough of Richmond upon Thames. Formerly a royal residence, it now houses the Royal Ballet Lower School, instructing students aged 11–16. This is a list of the 42 grandchildren of the British Queen Victoria and her husband Prince Albert, each of whom was therefore either a sibling or a first cousin to each of the others. It also lists Victoria and Albert's 9 children and 87 great-grandchildren, as well as the spouses of those children and grandchildren who married. The wedding of Princess Elizabeth and Philip Mountbatten took place on 20 November 1947 at Westminster Abbey in London. Philip had been made Duke of Edinburgh on the morning of the wedding. The wedding dress of Queen Victoria was worn by Victoria, Queen of the United Kingdom, at her wedding to Prince Albert of Saxe-Coburg and Gotha on 10 February 1840. She selected a white dress, which was considered an unusual choice at a time when colours were more usual, made from heavy silk satin. The Honiton lace used for her wedding dress proved an important boost to Devon lace-making. 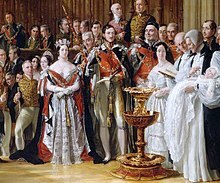 Queen Victoria has been credited with starting the tradition of white weddings and white bridal gowns, although she was not the first royal to be married in white. St Mary Magdalene Church is a church in Sandringham, Norfolk, England, located just to the northwest of Sandringham House. Members of the British Royal Family attend services when in residence at Sandringham, which normally includes Christmas. The current rector is the Reverend Canon Jonathon Riviere.